This card was made for the Stamp Simply challenge. You can read about it here. Black Versa Fine Ink on another piece of Neenah paper. Spellbinder's largest Label One was perfect to use for cutting out and embossing the image. Then I used JustRite's newest 1 3/16 Damask Stamp for the monogram. I sure do love this little guy as it is a perfect size for a card that has a large image stamped on it. The J is for a good friend whose birthday is coming up next week. The Dahlia die by Spellbinders was used to cut out the monogram and then I softly inked the edges before taking it out of the die for more impact. Using SU's ticket punch I punched each corner of the polka dot DP and then glued it down with my Glue Glider. I don't know if you can see the clear crystals that accents the tree, but this was a perfect finishing touch. Of course a small bow seemed be a necessity. The image and monogram are popped up with Thermo-O Web dimensionals. A very pretty card Joan! Joan, this is so pretty completed in black and white. I really like how you lightly sponged around the nestability. When I heard black and white, I wasn't too excited, but the card you made is so elegant. Very vibrant and it seems to just jump out at you. 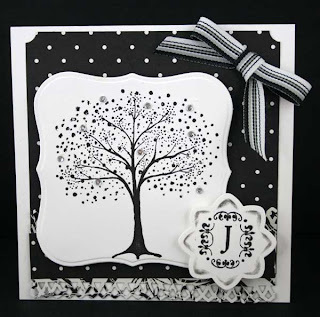 Beautiful card, Joan - I LOVE this in the black and white -- GREAT job!! !